JOYO, inspired by Rome's Trevi Fountain (Trevi Fountain) Inspired by the unique Gothic design style, a deep sense of Italian free aesthetic aesthetic style, combined with the international metropolitan women's fashion to express a deep understanding of their love , Highlighting the taste at the details, at the same time using high-grade Italian and Japanese fabrics, and strive to highlight the modern woman beyond self, self-reliance and the pursuit of individuality fashion expression. JOYO will be the perfect blend of fashion world in every detail of the product which, under the ultimate fusion of these women condensed into a woman of their own subtle and enthusiastic love, and this love into the hearts of women and urban women ideal life The pursuit of clothing throughout the design concept, so that urban women in the ultimate interpretation of the ideal life in different roles in different occasions. This beauty is JOYO perception of social change, change of life, change of fashion, aesthetic change and dare to break through and challenge, dare to change and dare to change bold innovation. 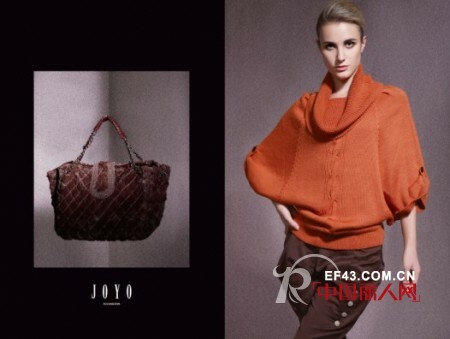 JOYO women to absorb the elements of Italian fashion, adhering to the classic, elegant costumes concept, clever use of color with the natural and tailored to show the simplicity of women, gentle features. Its unique "mature fashion in the distribution of youthful charm, elegant atmosphere," attracting more and more advocating the perfect modern woman. Joey International Co., Ltd. headquarters is located in the forefront of the world's fashion - Hong Kong SAR, in order to meet the changing needs of modern urban new women, at the same time, in line with women's consumer market, high-quality low-cost consumer demand, the company invested heavily in 2002 , In Shenzhen to create an area of â€‹â€‹20,000 square meters of modern "brand industrial park." Enterprises as innovation, change for the development of enterprise source drivers, and constantly improve the internal business processes, quality control processes, business processes and service processes to improve quality, efficiency and service quality. Its garment enterprises have been introducing the advanced equipment and advanced management concepts from Japan and the United States to the well-known and influential enterprises. Joey International Limited adhere to the "people-oriented" management mechanism, through the "pragmatic, progressive, innovative and cooperative" spirit of enterprise and "healthy, happy, united, caring" corporate culture, continue to create a remarkable performance in the apparel industry Occupy a lofty position.